Homeschooling, hormones, preschool shenanigans and one boy stuck in the middle. Can you relate? Good, because it’s great to know that we’re not alone! 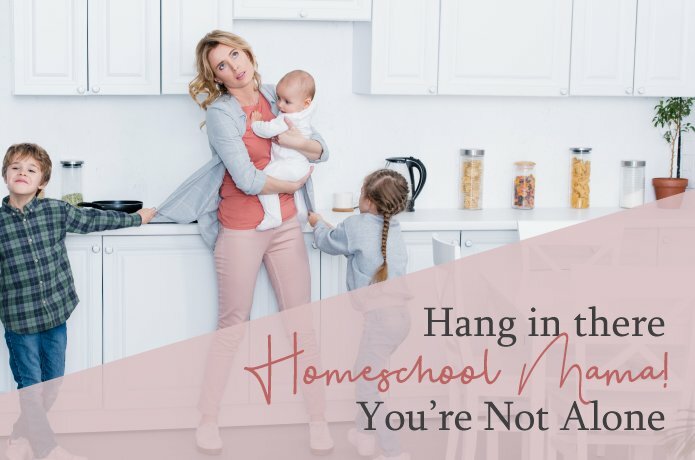 I remember haphazardly asking my husband a rhetorical (and somewhat sarcastic) question about homeschooling when the school officials gave up on our kids, “So what do you want me to do, homeschool them?” His simple shrug and those hopeful, albeit dreamy, eyes couldn’t stop my jaw from dropping. Fast forward three years later and here we are enjoying life in the carpool lane…at break-neck speed. I’ll be honest: life is fun, but also exhausting. Being a stay at home mother is amazing, but homeschooling is not for the faint of heart. Is it rewarding? Absolutely! Do I hide in my bathroom or closet some days? You betcha’! But, somewhere between the beautiful chaos, there is peace. I’m not a homeschool expert and I’m not going to quote any. I’m a mom who loves her children immensely enough to know when I need a break from my little blessings. So if you’re in the bathroom hiding out because your little one is having another melt down, remember…you are not alone. If you’re feeling frazzled after explaining long division for the umpteenth time to blank stares…you’re definitely not alone! Or perhaps you’re currently like me with hormonal teen/tween girls with mood swings, a 6 year old boy on the brink of becoming an Xbox addict; and, a preschooler who discovered how to break the “child proof” lock on the supply cabinet. Well, hopefully that last one is unique to my household! There’s a village of homeschoolers that don’t always have it all together. However, a simple scroll through social media might cause you to be discouraged.Those seemingly perfect pictures of smiling children learning latin and building something cool to show off their STEM skills. Meanwhile your preschooler can’t tell the difference between the letter B and the number two. Have you ever been at co-op and looked around and felt inadequate? Well, it’s time for you to relax and let reality set in. Looks are deceiving! That well coiffed kid might just have an extra pair of clothes in the family minivan because their mom is all too familiar with mobile food fights. That mom spends a few extra minutes trying to regain a sense of calm before walking in. Perhaps she doesn’t want to look like how we feel after dealing with rowdy kids. So, let’s be honest and speak up when it’s just one of those days. Let’s learn when to say ‘when’. You’ll be surprised when you speak with other parents – your kids aren’t as crazy as you might think. Take a moment to let yourself off the hook because someone’s shoe is missing and you’re late once again. Talk with other moms – vent a little and laugh a lot. It’s probably more therapeutic than we all might realize. I’m not sure of the science behind that claim, but I do know it sure feels good to let it out and eventually laugh at it all. Although, some things do need a little more time to find the humor in it (especially with little ones around!). One day you will laugh and you’ll have some great memories. Make the most of the time you have now by embracing this incredible unpredictable season of your life. Even if you have to take a little mommy break in your closet. One day you’ll laugh at the sight of those chubby little fingers wiggling under the door. I can’t promise you it’s going to get easier, but if we stick together it’ll be worth every hair raising moment. Go hug a homeschool mom today and let her know she’s not alone.